19.12.2012: I've updated the pattern, adding the US needle numbers throughout, and measurements in inches, too. Sorry for confusion! I needed a neckwarmer that will fit easily under jacket, something in the turtleneck style. The first attempt became too sloppy and too long, and simply didn’t want to lie as I wanted. As it turned out, the answer was changing to bulkier yarn and bigger needles. What I could never imagine in my wildest dreams, is that I would finish the neckwarmer in half a day! It is knitted topdown, starting with thinner needles. After ribbing the simple knit and purl pattern is knitted with bigger needles. Several rows of ribbing finish the neckwarmer, and increases make it flare a bit. To make it lie better, I’ve used even larger needles to bind off. The stitch pattern is completely reversible, you can easily turn the collar down if necessary, and it’s long enough to pull over the nose if polar temperature arrives. If you prefer a straight neckwarmer, use the same needles throughout and omit the increases in the end. 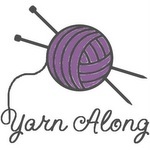 Suggested yarn: Lang Yarns Merino 70, 2 skeins, gauge 14 st x 4"
Section 1: With needles nr 5/US 8, CO 90 st, join to knit in the round, put a marker for beginning of round. Repeat rounds 1-2 of the stitch pattern, until work measures 5 cm/2". Section 2:Change to needles 6/US 10 and knit one pattern repeat. Section 3: Knit rounds 1-4 once. Note: Before increases my cowl measured about 15 cm/6", hope this helps since I give no row gauge! R 5: K 2, kfb, k 2, p 2, pfb, p 2. Continue in k 6, p 6 rib for another 10 rounds, or until the neckwarmer measures 21 cm/8". BO loosely, alternatively with needles 7/US 10 3/4. Wash and block if desired, pat the wet neckwarmer somewhat together to keep the three-dimensional look. Sorry, the coat hanger models, since I’m not in a good shape yet after surgery. The neckwarmer on picture hasn't been blocked yet! Please note that this is a free pattern, use it for gifts and charity, but please don’t sell items made with this pattern. Don't hesitate to contact me if something is unclear or you find mistakes!